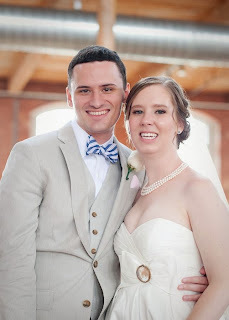 the eibls: The newlyweds are blogging! It's time to get back to blogging! Thanks to all of our family and friends for your love and support during our engagement and through the wedding! And especially your patience in the return of the blog. It really seems like some of you missed our kitchen ramblings! We have also missed recording tasty recipes so we could remember we liked them to cook again. - our registry! what we registered for and why. hint: we upgraded our cookware! as well as our dishes. We've missed you and look forward to getting back to blogging action! Hooray! And I like the new rebranding of the blog, too. I look forward to many upcoming delicious concoctions from the Eibl Kitchen! What great news! Can't wait for future posts from Mr. and Mrs. Eibl.